In a decade of change and consolidation, no one better epitomized the 1980's than media mogul than Rupert Murdoch. Murdoch's Fox Television Network was the first new network since the 1950s to compete with the "Big Three." In the 1980s, viewers had more media options. Thanks to deregulation, more channels were available and content was less restricted. There was a boom in the magazine industry, as magazine publishers streamlined their content for specific audiences. Many newspapers failed as production costs soared and consolidation ran amok. The 1980s saw the rise of women in the media, including Oprah Winfrey, Connie Chung and Barbara Walters. Likewise, African-American personalities were garnering power in various media. Cable news and MTV came to fruition, both catching the attention of the nation. In 1981, the U.S. launched the space shuttle Discovery. Young and old people alike mourned the death of John Lennon and celebrated the fall of the Berlin Wall. The term "Reaganomics" was coined to describe Ronald Reagan's pro-business platform. 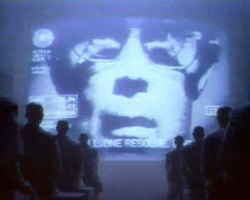 Murdoch became one of the world's media giants during the global media revolution of the 1980s. Building on successes in his native Australia and in England, Murdoch merged 20th Century Fox Film Corporation with several independent television stations to form the Fox Television Network in 1985. Fox was the first nationwide television network in the United States to be created since the 1950s. One of the premier media moguls of the 1990's, Ted Turner's CNN revolutionized television news with its non-stop coverage of the Gulf War and its 24-hour news cycle. Turner also helped develop several other cable channels, including his own Turner Network Television (TNT), TBS, and the Cartoon Network. Turner also played a large part in the massive Time-Warner-AOL merger. Brown was the editor of Vanity Fair, one of the most talked about and controversial magazines of the 1980s. She was a talented writer and editor, who successfully exploited the "me" generation's obsession with wealth, status, and celebrity. Vanity Fair combined stories about Soviet premier Mikhail Gorbachev with images of Roseanne and Tom Arnold mud wrestling. Maynard purchased the Oakland Tribune in 1983. He was the first African-American to own a major daily newspaper in the U.S. He was also the first African-American national newspaper correspondent and the first African-American editor-in-chief. In 1984, Winfrey moved to Chicago and began hosting A.M. Chicago, an ABC affiliate's morning public affairs show. Within three months, her show had outscored the ratings of the popular national talk show hosted by Phil Donahue. Winfrey changed the format of daytime talk show television by providing a platform for honest, sincere discussions of sensitive and sometimes controversial topics. Her nationally syndicated Oprah Winfrey Show was one of the most popular shows of the 1980s. Kuralt is most famous for his series On the Road for which he logged more than 1 million miles in six motor homes and produced over 450 shows. Kuralt had always been drawn to unusual stories and unsung heroes. On the Road provided him with a chance to show off America's beautiful landscape, acknowledge the unique individuals that make up the United States. Kuralt received eleven Emmy Awards and three Peabody Awards during his lifetime. In 1979, Walters joined Hugh Downs as co-host of the news magazine 20/20, and stayed with the show for 25 years. Her Barbara Walters Specials, where she interviewed world leaders and celebrities during prime time, generally enjoyed high ratings, juicy scoops, and occasional tears from the interviewee. One of Ronald Reagan's top aides, Deaver expertly handled the media during the early 1980s. He successfully cultivated an image of Reagan as a powerful and patriotic leader, while steering the president away from having much direct and unscripted contact with the press. While Deaver was able to help Reagan easily win reelection in 1984, Deaver would later be convicted of perjury charges, leaving the administration before the end of the second term. 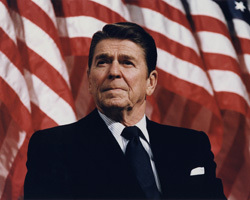 Ronald Reagan became as the 39th President of the United States in 1980. Reagan was a Hollywood actor and his speeches often reflected his acting skills. "Reaganomics", with its tax-cutting fervor and pro-business bias, helped to promote the rise in a culture of self-interest. The administration defended cuts in social spending by noting that it was trying to undo the damage of "Great Society" programs, which had fostered a culture of dependency. Globalization became the buzzword by the end of the 1980s, with increased international ownership reflecting the many mergers that took place. In the 1980s, another government scandal erupted, known as the Iran-Contra Affair. The executive branch of the United States government sold arms to Iran, using the funds to illegally finance the Contras, a rebel organization attempting to overthrow the socialist Sandinista government in Nicaragua. This was in direct defiance of the U.S. Congress, which had not approved previous attempts by Reagan administration to finance the Contras. Unlike Watergate in 1973, the Iran-Contra affair did not bring down the president. Reagan, a former movie actor, friend of many powerful media executives andwith a powerful PR image, enjoyed a warmer relationship with the media than his Republican predecessors. Televised Senate hearings were watched by millions daily but not with the same urgency as with Watergate. Television and radio talk shows debated over Iran-Contra, but the public eventually became bored with the whole affair. The liberal climate of the 1970s gave way to a more conservative attitude in the 1980s. There was a decline in activism, and the general mood reflected a belief that earlier movements had gone too far and that it was time to draw a moral and political line. The political energy, purpose, and perspective of the Reagan administration had a profound effect on American life in the 1980s. When Rock Hudson died from an AIDS-related illness in 1985, the disease became a matter of national concern. As the disease continued to spread, AIDS became the topic of daily conversation and headlines. The disease, which slowly and fatally devastated the human body, had no known treatment. It created tremendous fear and uncertainty among all walks of life. 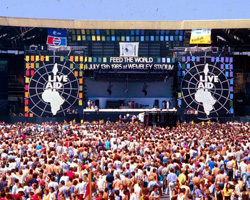 The Live Aid stage in London England, one of many around the world during the day long concert event. Rock star Madonna's number one hit song, Material Girl exemplified the decade's ethos of self-gratification and the desire for material possessions. The yuppie (young urban professionals) generation is sometimes referred to as the "me" generation. Yet the stars of the music industry found time to lend their efforts to bring attention to numerous causes, most noteably the Live Aid concerts to help bring food to starving people of Ethiopia. Though some of the promised food rotted in storage due to inadequate transportation, the effort was considered a huge success. On December 8, 1980, Lennon and his wife, Yoko Ono, were returning to their apartment home in New York when Mark David Chapman fired five shots at Lennon. Lennon, the former Beatle, died of his wounds shortly after. For many, the news first came to them from the mouth of Howard Cosell, a color commentator on Monday Night Football. Just two months into his presidency, Reagan was leaving the Washington Hilton Hotel when John Hinckley Jr., hidden among the onlookers, stepped out of the crowd and fired in the direction of the president. Music Television (MTV) aired the first music video in August 1981. The song, Video Killed the Radio Star by the Buggles, captured the essence of the era. During the 1980s, MTV was a dominant force on cable television system and often provided controversy with the music videos it showed.Only later would the network move into more conventional programing. In a campaign designed to revive the public's interest in space, NASA selected high school teacher Christa McAuliffe to journey into space with a team of astronauts. Seventy-four seconds after liftoff, the Challenger space shuttle burst into flames, killing everyone on board.The explosion was the media moment for a younger generation that the Kennedy assassination was to the youth of the 1960s. The physical manifestation of the Iron Curtain had separated East and West Berlin since 1961. Finally, on November 9, 1989, the East German government announced the border between East and West Berlin would be opened. Thousands of East Berliners poured into West Berlin, as young people climbed on top of the wall and began chipping away at the monument to Communism. 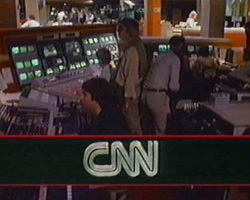 During the 1980s, media companies merged and increasingly focused on the prices of their stocks on the stock exchange. As these new media mega-companies went public, corporate leaders mandated that news should make money. The decade experienced rapid deregulation under the Reagan administration, which made new business developments possible. As a result, the broadcast industry began to focus more on the competitive nature of the industry and less on concepts of the public interest and public service. New technologies such as cable television, led to expansion and the creation of new networks such as CNN and Fox. The "Big Three," CBS, ABC, and NBC, were forced to reckon with these newcomers and fierce competition ensued. MTV aired the first music video in August 1981, with Video Killed the Radio Star by the Buggles. It was a one-hit wonder for the band, but a multi-billion dollar success for the producers. MTV showed music videos non-stop, 24-hours-a-day, every day, with occasional breaks for rock news, commercials and special programming. In the 1980s, when the underlying structure for the Internet was developed, the foundation was laid for one the biggest communication technology advances of the 20th and the following century. The personal computer also became a fixture in middle-class American homes and offices and set the stage forthe growth of the Internet a decade later. Coverage of conflict and war changed in the 1980s. The government believed that the press had interfered with the outcome of the war in Vietnam. Journalists war coverage was heavily restricted and press pools were created to provide coverage during excursions into Grenada and Panama.